For other uses, see Spaghetti (disambiguation). Spaghetti is the plural form of the Italian word spaghetto, which is a diminutive of spago, meaning "thin string" or "twine". The first written record of pasta comes from the Talmud in the 5th century AD and refers to dried pasta that could be cooked through boiling, which was conveniently portable. Some historians think that Berbers introduced pasta to Europe during a conquest of Sicily. In the West, it may have first been worked into long, thin forms in Sicily around the 12th century, as the Tabula Rogeriana of Muhammad al-Idrisi attested, reporting some traditions about the Sicilian kingdom. The popularity of spaghetti spread throughout Italy after the establishment of spaghetti factories in the 19th century, enabling the mass production of spaghetti for the Italian market. 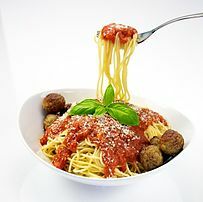 In the United States around the end of the 19th century, spaghetti was offered in restaurants as Spaghetti Italienne (which likely consisted of noodles cooked past al dente, and a mild tomato sauce flavored with easily found spices and vegetables such as cloves, bay leaves, and garlic) and it was not until decades later that it came to be commonly prepared with oregano or basil. Spaghetti is made from ground grain (flour) and water. Whole-wheat and multigrain spaghetti are also available. At its simplest, spaghetti can be formed using no more than a rolling pin and a knife. A home pasta machine simplifies the rolling and makes the cutting more uniform. Fresh spaghetti would normally be cooked within hours of being formed. Commercial versions of 'fresh' spaghetti are manufactured. 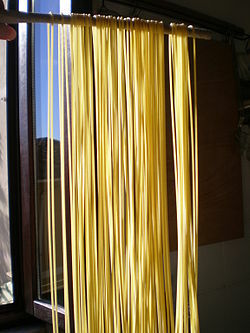 The bulk of dried spaghetti is produced in factories using auger extruders. While essentially simple, the process requires attention to detail to ensure that the mixing and kneading of the ingredients produces a homogeneous mix, without air bubbles. The forming dies have to be water cooled to prevent spoiling of the pasta by overheating. Drying of the newly formed spaghetti has to be carefully controlled to prevent strands sticking together, and to leave it with sufficient moisture so that it is not too brittle. Packaging for protection and display has developed from paper wrapping to plastic bags and boxes. 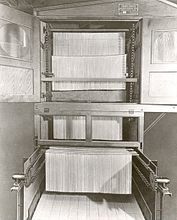 A hydraulic press with automatic spreader built by Consolidated Macaroni Machine Corporation, Brooklyn, New York. 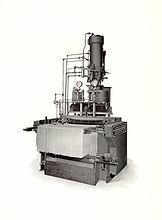 This machine was the first ever made to spread long cut alimentary paste products on to a drying stick for the automatic production of spaghetti. Dried spaghetti being measured with a "spaghetti measure". 1 portion of dried pasta equals 4.1 ounces, twice the amount of 1 serving on the package (1/2 in circle or 2 oz.). The measure can portion out 1, 2, 3, or 4 servings based on the diameter of the circle. This spaghetti is an enriched macaroni product made with 100% semolina. 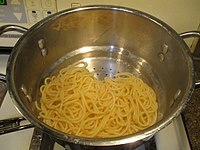 Fresh or dry spaghetti is cooked in a large pot of salted, boiling water and then drained in a colander (Italian: scolapasta). 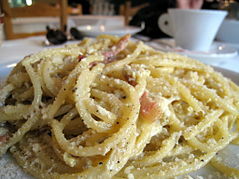 In Italy, spaghetti is generally cooked al dente (Italian for "to the tooth"), fully cooked but still firm to the bite. It may also be cooked to a softer consistency. Spaghettoni is a thicker spaghetti which takes more time to cook. Spaghettini is a thinner form which takes less time to cook. Capellini is a very thin form of spaghetti (it is also called "angel hair spaghetti" or "angel hair pasta") which cooks very quickly. Utensils used in spaghetti preparation include the spaghetti scoop and spaghetti tongs. 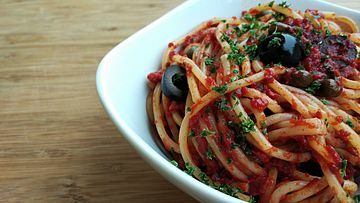 An emblem of Italian cuisine, spaghetti is frequently served with tomato sauce, which may contain various herbs (especially oregano and basil), olive oil, meat, or vegetables. Other spaghetti preparations include amatriciana or carbonara. 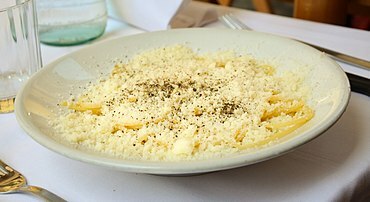 Grated hard cheeses, such as Pecorino Romano, Parmesan and Grana Padano, are often sprinkled on top. In some countries, spaghetti is sold in cans/tins with sauce. In the United States, it is sometimes served with chili con carne. Unlike in Italy, in other countries spaghetti is often served with Bolognese sauce. In the Philippines, an immensely popular variant is the Filipino spaghetti, which is distinctively sweet with the tomato sauce sweetened with banana ketchup or sugar. It typically uses a large amount of giniling (ground meat), sliced hotdogs, and cheese. The dish dates back to the period between the 1940s to the 1960s. During the American Commonwealth Period, a shortage of tomato supplies in the Second World War forced the development of the banana ketchup. 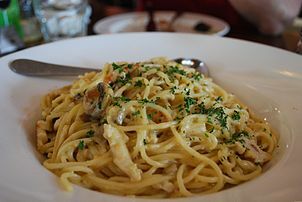 Spaghetti was introduced by the Americans and was tweaked to suit the local Filipino predilection for sweet dishes. Sapaketti phat khi mao (Spaghetti fried drunken noodle style) is a popular dish in Thai cuisine. For a more comprehensive list, see List of pasta dishes. 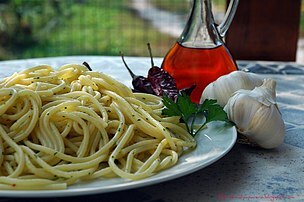 Spaghetti aglio e olio – ("spaghetti with garlic and oil" in Italian), a traditional Italian pasta dish coming from Naples. Spaghetti alla puttanesca – (literally "spaghetti whore-style" in Italian), a tangy, somewhat salty Italian pasta dish invented in the mid-20th century. The ingredients are typical of Southern Italian cuisine: tomatoes, olive oil, olives, capers and garlic. Spaghetti alla Nerano - from the village of Nerano, near Naples. With fried zucchinis and a local variant of provolone. 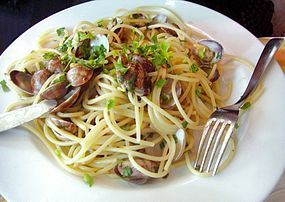 Spaghetti alle vongole – Italian for "spaghetti with clams", it is very popular throughout Italy, especially its central regions, including Rome and further south in Campania (where it is part of traditional Neapolitan cuisine). By 1955, annual consumption of spaghetti in Italy doubled from 14 kilograms (30.9 lb) per person before World War II to 28 kilograms (61.7 lb). By that year, Italy produced 1,432,990 tons of spaghetti, of which 74,000 were exported, and had a production capacity of 3 million tons. Pasta provides carbohydrates, along with some protein, iron, dietary fiber, potassium and B vitamins. Pasta prepared with whole wheat grain provides more dietary fiber than that prepared with degermed flour. The world record for the largest bowl of spaghetti was set in March 2009 and reset in March 2010 when a Buca di Beppo restaurant in Garden Grove, California, filled a swimming pool with more than 13,780 pounds (6,251 kg) of pasta. Spaghetti Westerns have little to do with spaghetti other than using the name as a shorthand for Italian. The BBC television program Panorama featured a hoax program about the spaghetti harvest in Switzerland on April Fools' Day, 1957. ^ a b spaghetti. Dictionary.com. Dictionary.com Unabridged (v 1.1). Random House, Inc. (accessed: June 03, 2008). ^ a b "How to Make Spaghetti". Better Homes and Gardens. Retrieved on 22 December 2014. ^ "Pasta is Not Originally from Italy". www.todayifoundout.com. Retrieved on 22 December 2014. ^ "History and Origin of Pasta". www.101cookingrecipes.com. Retrieved 2017-01-16. ^ Kummer, Corby (1 July 1986). "Pasta". The Atlantic. ^ Whiteman, Kate; Boggiano, Angela; Wright, Jeni (2007). The Italian kitchen bible. Hermes House. pp. 12–13. ISBN 978-1-84038-875-6. ^ The Settlement Cook Book: Tested Recipes from the Settlement Cooking Classes, the Milwaukee Public School Kitchens, The School of Trades for Girls, and Experienced Housewives. Settlement Cook Book Company. 1921. ^ Mazdaznan encyclopedia of dietetics and home cook book: cooked and uncooked foods, what to eat and how to eat it ... Mazdaznan associates of God. 1909. ^ Levenstein, Harvey (2002). Counihan, Carole M., ed. Food in the USA: A Reader. Routledge. pp. 77–89. ISBN 0-415-93232-7. ^ Gisslen, Wayne; Griffin, Mary Ellen; Le Cordon Bleu (2006). Professional Cooking for Canadian Chefs. John Wiley & Sons. p. 635. ISBN 0471663778. ^ "Homemade Spaghetti". Instructables.com. 16 October 2008. Retrieved 19 December 2014. ^ "Pasta Manufacturing" (PDF). Epa.gov. August 1995. Retrieved 19 December 2014. ^ Halpern, Sue; McKibben, Bill (May 2015). "Filipino Cuisine Was Asian Fusion Before "Asian Fusion" Existed". Smithsonian Magazine. Smithsonian Institution. Retrieved 16 December 2018. ^ "The Origin of the Filipino Style Spaghetti". Juan Carlo. Retrieved 16 December 2018. ^ Estrella, Serna (30 July 2014). "The Origins of Sweet Spaghetti: A Closer Look at the Filipino Sweet Tooth". Pepper.ph. Retrieved 16 December 2018. ^ "How to make Sweet Filipino Spaghetti with Meat Sauce". Asian in America. Retrieved 16 December 2018. ^ "Drunken Noodles » Real Thai Recipes » Authentic Thai recipes from Thailand". Realthairecipes.com. 12 June 2007. Retrieved 15 September 2018. ^ Zanini De Vita & Fant 2013, p. 68. ^ a b Salerno, George (13 December 1956). "Spaghetti consumption up as national dish in Italy". Wilmington Morning Star. 90 (52). Wilmington, North Carolina. United Press. ^ "Spaghetti, Enriched, Dry" (PDF). United States Department of Agriculture. October 2012. Retrieved 16 December 2014. ^ a b Ridgwell, Jenny (1996). Examining Food and Nutrition. Heinemann. p. 94. ISBN 0435420585. ^ "1957: BBC fools the nation". On This Day. BBC. Retrieved 11 November 2018. Zanini De Vita, Oretta; Fant, Maureen B. (2013). Sauces & Shapes: Pasta the Italian Way. New York: W. W. Norton & Company. ISBN 978-0-393-08243-2. Butler, Stephanie (June 12, 2014). "Spaghetti and Its Sauces". History Channel. Retrieved 16 December 2014.